1. The Union Cabinet chaired by the Prime Minister Narendra Modi has given its approval for the signing and ratification of the Extradition Treaty between India and Lithuania. It will bring the criminals to justice, with a view to ensure peace and tranquillity to the public at large. 2. The Union Cabinet has given its approval for signing and ratification of the Bilateral Investment Treaty (BIT) between the India and Belarus on Investments. The Treaty is likely to increase investment flows between the two countries. 3. The Union Cabinet chaired by the Prime Minister Narendra Modi has been apprised of the Memorandum of Understanding between Ministry of Railways, Government of India and the Federal Department of the Environment, Transport, Energy and Communications of Swiss Confederation on Technical Cooperation in Rail Sector. 4. The Union Cabinet, chaired by Prime Minister Narendra Modi, on Wednesday gave ex-post facto approval to an MoU between India and Myanmar on the upgradation of the Women`s Police Training Centre at Yamethin, Myanmar. The MoU covers upgradation of the Yamethin Women`s Police Training Centre to further augment the capabilities of the Myanmar government to build capacities of its police force with technical and financial assistance from the Indian government, an official statement said. 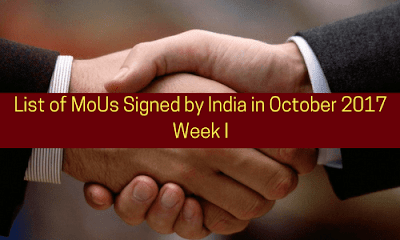 This MoU was signed during Prime Minister Modi`s recent visit to Myanmar. Finance Contract of Bangalore Metro Rail Project Phase-2-Line R6 for Euro 300 million out of total loan of Euro 500 million. Joint Declaration between the Interim Secretariat of the International Solar Alliance and the European Investment Bank. 6. The Union Cabinet chaired by the Prime Minister Narendra Modi has given its approval to sign the Agreement between India and Ethiopia on “Cooperation in the field of Information, Communication and Media”. iii. Bilateral investment Treaties (BITs) or Bilateral Investment Protection Agreements (BIPAs) are agreements between two countries for the reciprocal promotion and protection of investments in each other's territories by individuals and companies situated in either State. They provide treaty based protection to foreign investment. The BITs are thus bilateral agreements by countries to protect the investment by each country’s investors in the other country. Though they are signed by governments, their beneficiaries are business entities. iv. The International Solar Alliance (ISA) is an alliance of more than 121 countries, most of them being sunshine countries, which come either completely or partly between the Tropic of Cancer and the Tropic of Capricorn. The alliance's primary objective is work for efficient exploitation of solar energy to reduce dependence on fossil fuels. This initiative was first proposed by Indian Prime Minister Narendra Modi. India & France jointly launched this program. vi. Extradition refers to the surrender of a criminal to one country by another. The process of extradition is regulated by treaties between the two countries. Extradition is important because it helps to maintain the sanctity of the penal code of one country or territory. The penal code says that it shouldn't apply its criminal law to a person who committed an offence outside its territories except when the crime is related to the country's national interest.